Are you a mum or dad raising a family? So many carers now want to supplement their family time with getting advanced qualifications and studying so they can diversify their already busy and full lives. There are so many reasons for this. Studying helps to keep you connected, keeps your skills current, makes you more attractive to prospective employers and helps you really live out your personal and professional goals. Think of all the things you could achieve. Do you want to start your own business? Write a book? Learn computer programming? Gain a qualification that would allow you to work from home, such as accounting? The options are pretty much endless. In today’s competitive world, more and more people are recognising that a good education is integral to achieving the life that you want. Whether it’s via a vocational course, diploma, degree, or master’s program, it’s important to take any chance to learn and further your own skill and talent. But what happens if you feel that you just don’t have any time to devote to classes and studies? 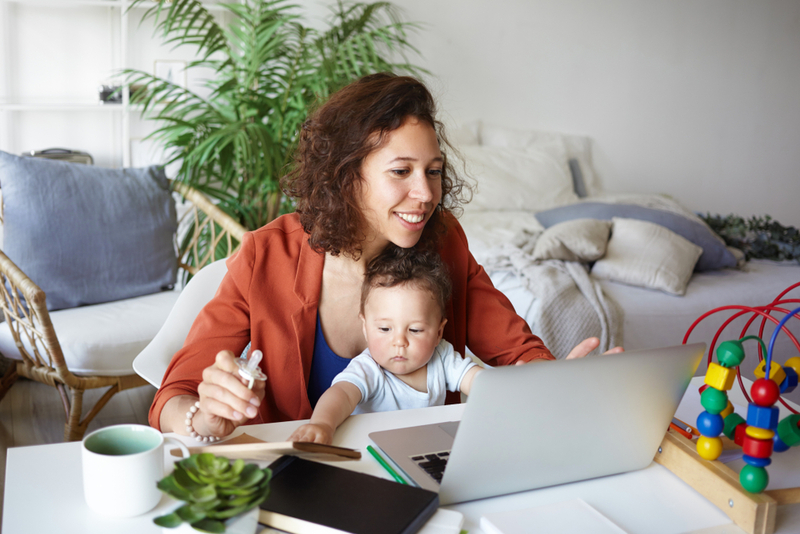 Let’s face it: getting your qualification while working and raising a family will challenge and stretch you more than ever before, but the good news is that it can be done. Many graduates have balanced their personal life, work, and studies very successfully. Today there are so many flexible study options for you to consider – and with quicker internet speeds, more advanced learning platforms, better connectivity and more choices of online quals – you’re in a great position if you want to study – but have many family commitments to consider as well. If you’re a full-time parent or work a full-time job and are thinking about furthering your studies, or if you’ve already taken that big step but find yourself lacking in motivation, Upskilled has something for you. Here are the ten hacks to getting that diploma despite your busy schedule. American entrepreneur, author, and motivational speaker, Jim Rohn said, “If you don’t design your own life plan, chances are you’ll fall into someone else’s. And guess what they have planned for you? Not much.” The most important thing is to really work through all the fine details. This makes sense. In the USA over 4.8 million people are both studying and raising a family. Sit down and go through everything, and consider all angles of your goal. What career or personal outcomes are you aiming for? How many modules or units does your course contain? Many students choose courses that are flexible because this allows them the freedom to study according to their availability. No net start or finish dates can also be very helpful. Once you have all of the information that you need and have some sort of strategy, you are now to do the rest of your research. Consider all the things that will make your life easier. Do you have access to a decent computer? Do you have a quiet study space set up? Can someone look after the kids a couple of hours a week to give you some “you” time? One of the most important resources that you have as you juggle all your responsibilities is your support system. Make sure that your employer, spouse or partner, friends, and extended family are backing you 100%. Your employer may delegate some of your work commitments to your peers allowing you to make time for studies. Ask your family beforehand if they would be willing to handle more duties relating to the caring of the children and household. If this is impossible, then that’s OK – use lateral thinking to work around the problem. Find small snippets of time to get some of your work in – it’s not always easy but if you’re motivated, it can be done. It’s a good idea not to overload your schedule with study work that may be more difficult or demanding than it needs to be. Short blocks of allocated time are fine – there is no need to have full days devoted to study. Work out when your best study times are. Are you a night owl? A morning person? Do you like to listen to music or do you need silence? Spread your working tasks out so that you have a good balance between challenging modules of work and easier ones. This will allow you more time to work, study, and devote time to your family. Every parent knows that children are frequently down with the flu, ear infections, or mild cases of conjunctivitis. Maybe your kids are just having a “grizzly day” and need a bit more attention than normal? Factor this in to your plan – well in advance. In a world with so many distractions, it’s important to minimise outside “noise”. Turn your TV off, put the phone on silent, and just focus on doing your work. Cassandra George-Sturges, author and parent says, “If you have a favourite TV show, watch it, but don’t idle in front of the TV.” This means don’t channel surf aimlessly. Plan time to relax and plan your tasks hour by hour and when it’s time to get to work – sit down and don’t procrastinate. Maximising your time also means learning to prioritise. Pencil in time with the kids. Spend a bit of time on the weekends to catch up with family and friends. Allow yourself to be human. Treat yourself to nice things – an hour to read a book, a decent cup of coffee, a phone call with your mum or best friend to just talk about “you”. Think about what you can cut back on. There is no need to be a martyr! Can the washing wait one more day? Do you really need to make time for that friend who’s bugging you daily for your time? Do the in-laws really have to visit this weekend – couldn’t you meet them at a local café instead? Cut back where you can. If you spend too much time in the evening cooking, learn some simpler recipes and order takeaway on the weekends. Buy comfortable clothes. Arrange your home so that it’s streamlined, meaning you can study or work while you’re watching your children. If this means moving their toys and crib into the living room, then so be it. Seek out other parents who are in the same boat. If you’re enrolled in online or distance classes, utilise the forums to find other studying and working parents in the same area. Your children will be able to play together as you study, or you’ll be able to take turns watching over the children as you adjust to the demands of work and school. Either way, it’s a win-win situation. You and your kids both make new friends and you’re able to free up more time to work. Connect wide your community – many libraries and community groups run programs for mums, dads and other parents to meet up for various tasks. Take advantage of what’s free and local. Remember that your children are a big reason for the sacrifices that you’re making, so don’t let them be the excuse for not pushing yourself to fulfill your dreams. Instead, be inspired by them and hope that one day, they will be inspired by you. Find some time to spend with them. Physical activities like playing in the park or a day at the beach will help you release a bit of tension and will also tire them out and allow them to sleep earlier and longer through the night. Factor “other activities” into your weekly plan, alongside your study tasks. Yes, YOU! Think of all the things you have already achieved. Having a family is a big task and offers big rewards. Think of your career history – whatever it is, and be proud of what you’ve done in the past. Remember who you are and focus on your dreams. Know that you CAN achieve what you set out to do. It’s easy to lose confidence, especially if you feel that you’ve been out of the loop for sometime. But it’s easy to get back into things, it really is. The trick is to keep focused and to never lose sight of your goal. After all, education is one of the most valuable things you can do to better yourself. It doesn’t matter who you are or what you want to achieve as long as you have the desire for it. Only you can truly live your dreams. No one can do this for you. The demands of your courses, your job, and your family might seem overwhelming but you are not alone! Remember that every day brings you one step closer to your goal, and every completed requirement, project, or responsibility is a small, but very real, victory. Keep in mind that every day is another chance to make the best out of the only life that you have and to make the lives of your children ones that they deserve. Whether you’re a mum, dad or other carer – make sure you remember to focus on what you want for your own future. You truly deserve it. We want to hear from you! What sort of struggles do you have with managing work, family, and your studies? Do you have any techniques that make life a little bit easier for you? Tell us in the comments below and you could win a $2000 Education Scholarship, courtesy of Upskilled. Yvette McKenzie Yvette McKenzie is a content strategist, journalist and digital marketer who works for Australia's most progressive online educator, Upskilled.